Dark Peak Peregrine ‘abandons’ nest containing three eggs. Really? So said Alexander Pope in his ‘Essay on Man’ written in 1732. This is a metaphor for man’s ability to keep on hoping that everything will work out for the best in the end no matter what the odds and it perfectly sums up the attitude of Raptor Workers at the start of every breeding season. Autumn and winter in the northern uplands can be long, cold, wet dreary months. Eventually the wet grey days and long dark nights give way to warmer days; the clocks go forward and nature wakes up and bursts into life again. However; despite following Pope’s philosophy spring time in the northern uplands always induces a mixture of elation and trepidation for NERF members. Having spent hundreds of long cold hours on the fells monitoring and protecting Hen Harriers on their roosts, often in dreadful weather, spring offers new hope. With luck the coming raptor breeding season will be successful; the weather will be kind, prey will be plentiful, clutch sizes will be large and by mid-summer young fledglings will be on the wing. That’s the hope but unfortunately the spectre of raptor persecution is never far away. We understandably spend a great deal of time discussing and condemning Hen Harrier persecution however we shouldn’t lose sight of the fact that there is evidence that all bird of prey species face the threat of persecution throughout the whole of the NERF raptor study area. 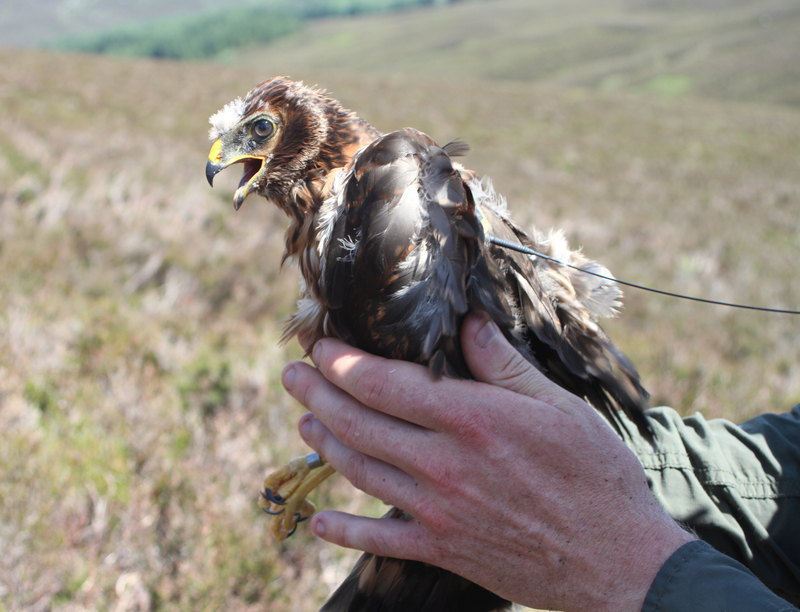 Along with Hen Harriers we know that Buzzards, Goshawks, Short-eared Owls and Peregrine Falcons remain victims of egg collectors and they continue to be trapped, poisoned and shot to death annually. The problem is particularly acute in North Yorkshire and the Dark Peak but no region is totally immune. Peregrine populations have been suppressed by persecution in the northern uplands for decades and in the Dark Peak Peregrines have had a torrid time for many, many years. 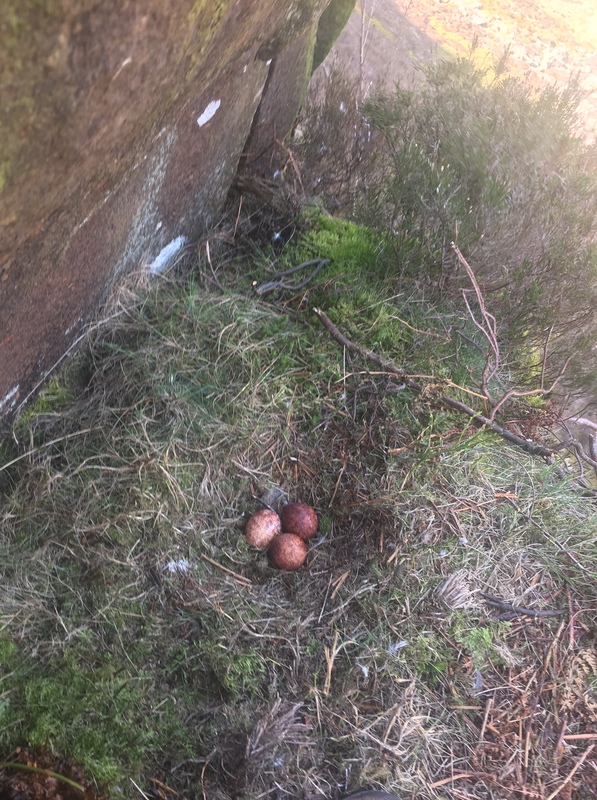 This latest incident, which occurred in the Peak District National Park, involved an active Peregrine nest where the adults ‘disappeared’ leaving 3 unhatched eggs. On the 26th of March 2019 two licensed Raptor Workers, from the Peak District Raptor Monitoring Group, were checking an historic peregrine breeding site on a remote crag on a grouse moor in the Glossop area when they witnessed a food pass between a male and female Peregrine Falcon. Along with this observation the Raptor Workers watched the adult male drive off a Kestrel that had strayed into the potential breeding area. From experience they quickly realised that this was a precursor to a breeding attempt and determined that they would return two weeks later. The Raptor Workers returned to check on progress at the breeding site on the 8th of April 2019. After observing the nest site from a suitable distance for some considerable time they were dismayed when they realised that there were no adults present on the crag. In order to confirm whether or not the Peregrines had actually commenced breeding they made a licensed visit to the nesting ledge and there they discovered three cold Peregrine Falcon eggs. Whilst we may never know what actually occurred at this site research tells us that Peregrine falcons do not abandon their eggs unless one or both of the birds have been either killed or kept off of their nest for a very long period of time. The average incubation period for Peregrine eggs is 31 days [BTO] and yet adults are so committed to hatching their eggs they will continued incubating infertile eggs for periods considerably longer that the normal 31 days. Taking into account that the adults were absent, that the eggs were cold, that the nest was located in an area where raptor persecution is rife it is difficult to perceive a cause of this failure that doesn’t involve human interference at the site. Peregrines are one of the earliest raptors to breed and this incident reminds all of us, not just Raptor Workers, that we must be vigilant whilst monitoring, or simply enjoying watching, all raptor breeding attempts. They are all vulnerable and NERF will play its part in protecting them in the months and years ahead. To some, following the philosophy ‘hope springs eternal’ may appear naïve when persecution of birds of prey continues apace. However; if we lose hope we lose everything. We will never lose hope; our magnificent birds of prey deserve no less. Persecution is pernicious and there is no place for it in modern day society. For future information on the level of raptor persecution in the Dark Peak click on the links below. The Peak District Bird of Prey Initiative 2018 – Peak District National Park Authority, National Trust, Moorland Association, Natural England and both of the local Raptor Groups [The RSPB left the Initiative in early 2018 due to a lack of progress and ongoing raptor persecution incidents]. Raptor Persecution in the Peak District National Park – Melling et al 2018, highlighting the fortunes of breeding peregrine and goshawk in the Peak District National Park and the association of raptor persecution with driven grouse shooting. This entry was posted in NERF Statement and tagged Birds of Prey, Peak District, Peregrine Falcon, Raptor Monitoring, Raptor Persecution, Raptor Workers on 18/04/2019 by raptorforum. Until the next time; and regrettably there will be a next time. Knowing that there would be a ‘next time’ did not take away the pain felt when we learnt that yet another young Hen Harrier had joined the ‘disappeared’ in suspicious circumstances. Little did we know when the article about River was written that Vulcan’s satellite tag had already suddenly and inexplicably stopped transmitting six days previously. 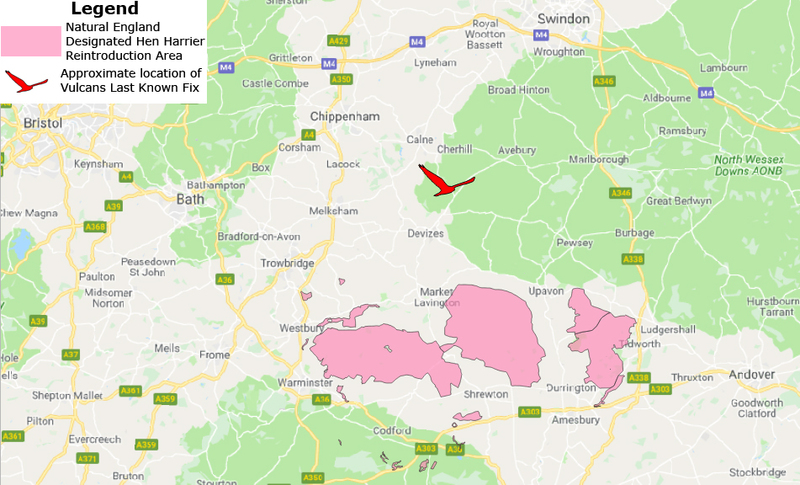 Vulcan, one of five chicks from Northumberland, drifted south through the Peak District to Hampshire, spent time in Dorset before the tag finally sent out the last transmission from farmland, managed for pheasant and partridge shooting south of Calston Wellington, North Wiltshire. Regrettably Wiltshire is no stranger to controversy where Hen Harriers are concerned. This is the county where Natural England propose to release circa 100 hen Harrier chicks, sourced from the Continent, over a 5-year period, as part of their southern reintroduction scheme. Natural England has always proclaimed that the area is a safe haven for reintroducing Hen Harriers – an essential condition for such reintroduction programmes, yet this new evidence would suggest that this is not the case. The fact that Vulcan has inexplicably ‘disappeared’ in an area approximately 10 kilometres to the north of the proposed release site is of great concern to our members. NERF raptor workers are largely responsible for locating breeding attempts, monitoring the birds throughout the breeding season, ringing and satellite tagging the chicks in the North of England in partnership with RSPB. NERF has consistently opposed Natural England’s southern reintroduction scheme, which we believe is designed to divert attention away from the continuing tragedy of persecution of Hen Harriers, which remains the biggest threat to the species throughout England. Importing young birds and releasing them to face an uncertain future in the lowlands will not, in the opinion of NERF, be the panacea for Hen Harrier survival as a breeding species in England as envisaged by Natural England. The fate of Vulcan clearly demonstrates this. Nor will be a substitute for the demise due to persecution in upland areas. 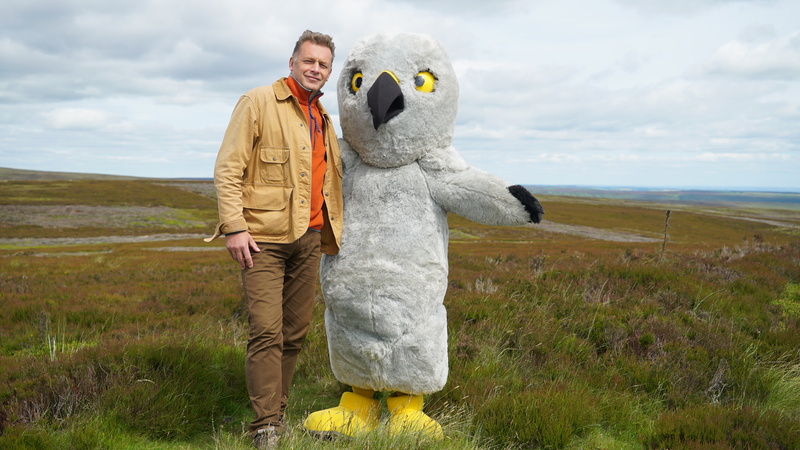 NERF urges Natural England to abandon the scheme and concentrate on resolving the primary problem of Hen Harrier persecution on land predominantly used for driven grouse shooting. NERF would like to thank the Forestry Commission, RSPB Life Project and Raptor Workers who watched over and protected Vulcan. You did a magnificent job and you should be proud of your efforts. NERF would also wish to thank Wiltshire Police and RSPB Investigations Team for their hard work investigating the disappearance of Vulcan. This entry was posted in NERF Statement and tagged Birds of Prey, Hen Harrier, Missing Hen Harrier, Raptor Monitoring, Raptor Workers, Satellite Tag, Vulcan on 12/03/2019 by raptorforum. Congratulations Chris, the award of the CBE in the New Year’s Honours List is well deserved. The conservation of our natural environment has always had a place in the public’s heart and yet the protection that it requires has for too long been seen as a ‘Cinderella’ service by successive Governments. Decades of avoidable decline have left many species and habitats vulnerable to minor changes that could have a major, negative impact. This is not a prediction, we are already witnessing potentially catastrophic changes occurring all around us. Fortunately if the correct remedial policies are implemented the situation can be reversed. Now they have a champion recognised both publicly and politically for years of effort, speaking out on behalf of our natural heritage. This entry was posted in Uncategorized on 30/12/2018 by raptorforum. Two owls shot in the Dark Peak – why? Once again the National Trust and the Peak District National Park Authority are in the news and once again it’s for all of the wrong reasons. The area has a long, well documented, history of raptor persecution. However; in 2018 there were the first signs that a corner may have been turned and perhaps, just perhaps things were slowly improving for the beleaguered birds of prey in the Dark Peak. Hen Harriers bred for the first time in several years and was celebrated by everyone involved. Surely that was a positive signal, a glimmer of hope? Well if it was a glimmer of hope it was soon extinguished and the Dark Peak is once again a dark place for birds of prey. 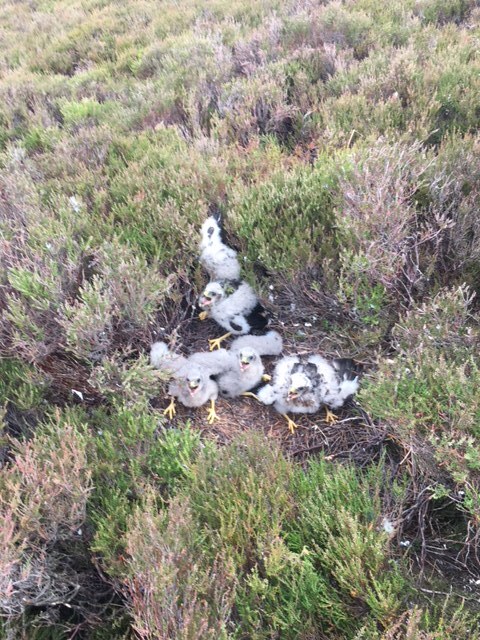 Local Raptor Workers, all NERF members, are still trying to come to terms with the ‘disappearance’ of two satellite tagged Hen Harrier chicks, Octavia and Arthur, which fledged from the Dark Peak during the summer. Now we learn that a Short-eared Owl [SEO] was shot on 11 September on National Trust land on Marsden Moor near Wessenden Head, West Yorkshire. Additionally we learned that three weeks later on 1 October a Tawny Owl, which had also been shot was found stuffed into a drystone wall on land nearby but not on the National Trust property. In the first incident a local runner had just returned to her car when she saw a Short-eared Owl fly over her head then heard gunshots from the direction of a vehicle described as a dark coloured pick-up truck with two dog cages with a thick wooden cover over the cages, parked nearby. The following morning the witness returned to the same location and found the SEO alive but injured. The bird was taken to a vet for treatment; however the injuries were so severe the bird had to be euthanized. Short-eared Owls are scarce birds in the North of England, they are ‘Amber Listed’ as a species of concern in the UK. The breeding population which is probably less than a 1000 pairs in years when the vole population, a primary prey source, is low. This situation is taken so seriously that Special Protected Areas [SPAs] are designated for Short-eared Owls. Marsden Moor is part of one such SPA. If Short-eared Owls are supposed to be safe anywhere then land specially designated for their protection should be the ideal place to reside. On this occasion that was clearly not the case. We know of one SEO that was shot; how many more raptors have been shot in this area that we don’t know about? The persecution of owls, particularly Short-eared Owls, is a continuing problem in the North of England. This was demonstrated recently by a court case involving a gamekeeper convicted of shooting two owls in the Yorkshire Dales National Park. The evidence strongly points to the fact that Short-eared Owls are being specifically targeted on upland estates. Despite conducting extensive enquiries in the area West Yorkshire Police have been unable to trace the owner of the vehicle, with the very distinctive dog cages on the back, which was seen by the witness at the time that the SEO was shot. What was the motive for killing the two owls? Who is most likely to profit from killing them? Is it possible that they were killed by some random passer-by who just happened to be parked up in in the area with a firearm to hand at the time the SEO flew overhead? Possible, but is it likely? Probably not. No doubt the Investigating Officer(s) will be following these and other lines of enquiry. Identifying the individual(s) who has the Modus Operandi [MO], the opportunity and the desire to commit these crimes is the key to detecting them and NERF expects every member of the Raptor Persecution Priority Delivery Group to assist West Yorkshire Police in their enquiries to solve these crimes. This entry was posted in NERF Statement on 09/12/2018 by raptorforum.